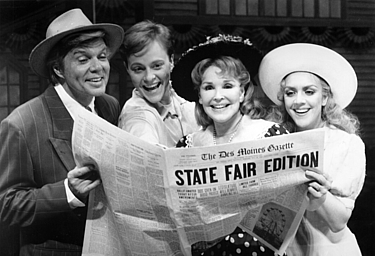 Fifty years after it was introduced, STATE FAIR, Rodgers & Hammerstein's only musical written for the screen, has finally made it to the stage. The story of the Frake Family of Iowa and their outing to the State Fair, Rodgers & Hammerstein's "newest" musical began its National Tour, naturally, in Des Moines during the opening of the '95 Iowa State Fair in August. 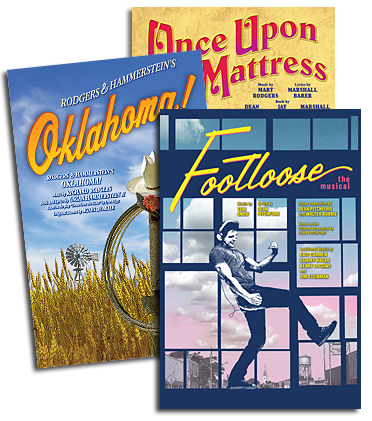 The Theatre Guild, Rodgers & Hammerstein's first producers of OKLAHOMA!, carousel and ALLEGRO, revived that tradition as producers of this STATE FAIR, with Philip Langner and Robert Franz at the helm. Governor Terry E. Branstad hosted the opening night performance, where stars John Davidson, Kathryn Crosby, Andrea McArdle, Donna McKechnie, Scott Wise and Ben Wright were hailed as adopted hometown heroes and even made honorary Iowans. Also on hand were Rodgers & Hammerstein - Mary Rodgers and her family, and Hammerstein's son James, who not only carried the family name but also its theatrical pedigree - in this case, as co-director of STATE FAIR with Randy Skinner. To the Des Moines crowd, every line in STATE FAIR that mentioned blue ribbon-winning hogs, tractor pulls, or corn dogs on the midway hit home with gusto. Songs like "It Might as Well Be Spring" and "It's a Grand Night for Singing" were greeted as good old-fashioned showstoppers, while lesser-known numbers like "So Far" and "The Man I Used to Be" were warmly welcomed. As for "All I Owe Ioway," it was received by the hometown crowd as nothing short of a standing-o, rip-roaring love-anthem to their Hawkeye State, earning STATE FAIR a front-page rave review in the Des Moines Register. In the months and cities that followed, this STATE FAIR, to quote Hammerstein's opening lyric, proved to be "a great STATE FAIR" that triumphed far beyond local pride. In Chicago, Sun-Times critic Hedy Weiss declared, "The show is perfection...Just pin that blue ribbon on the theater marquee," while her colleague Richard Christiansen of the Tribune wrote, "This is a smart, sharp and refreshing show, bursting with wonderful songs and beautiful voices, staged with savvy and snap, and performed with gusto, good humor and charm." Milwaukee Journal-Sentinel critic Damien Jacques called it "a pure delight... sweeter and more fun than cotton candy." Typical of many reviewers, Pamela Sommers of the Washington Post felt that STATE FAIR is "corny and quaint, straight as an arrow and sentimental as all get out...But gosh darn it, [this] newly minted production...is surprisingly hard to resist." Philadelphia Inquirer critic Clifford Ridley, after telling his readers that he "fell for" STATE FAIR the first time he saw it on screen, confessed that, having now seen it on stage, "I tumbled for it all over again." Robert Hurwitt of the San Francisco Examiner saluted STATE FAIR for having "more glorious melodies than Broadway has seen in a very long time, [sung by] the kinds of gloriously bright voices...that remind you of Broadway's heyday." And in the trade paper Variety, Chris Jones decreed that "the crowd- pleasing charms of [this] 'new' musical are considerable and compelling - a witty book, lush R&H songs and a barrelful of strong performances are what provoked the lengthy and much-deserved standing ovation."